Social media activity shows potential customers that your brand is a real, thriving business. According to Inc, “a social media page establishes that brand is active”. Think about it. When researching a new business, most people will generally look up that company’s social media profiles as well. As such, the importance of social media activity is to build brand authority which consumers can trust. Social media also humanizes brands and gives them the opportunity to build two-way relationships with customers as it can also be used as a customer-service outlet. More and more people reach out to businesses over private messages, comments, or tweets, and expect timely responses. With this in mind, one of the best practices for social media is responding to customer interactions within 24 hours (or 48 hours at its max). This not only demonstrates that your business is reliable, but that it’s credible as well. It should come as no surprise that consumers turn to web searches and social media to make informed decisions before making a purchase. According to Go-Gulf’s infographic, “46% of web users look towards social media when making a purchase”. Additionally, they also found that people typically follow brands for promotions and discounts, information about the latest products, as well as for customer service. As discussed in an article by BizJournals, another report by Deloitte also found that 47% of millennials are influenced in their purchases by social media. With this in mind, brands that don’t maintain an active presence on social media are at a disadvantage because consumers aren’t as likely to engage with them online. According to Invesp, “71% of consumers are more likely to make a purchase based on social media referrals”. Furthermore, their research found that 78% of their respondents said that social media posts by companies have impacted their purchases. 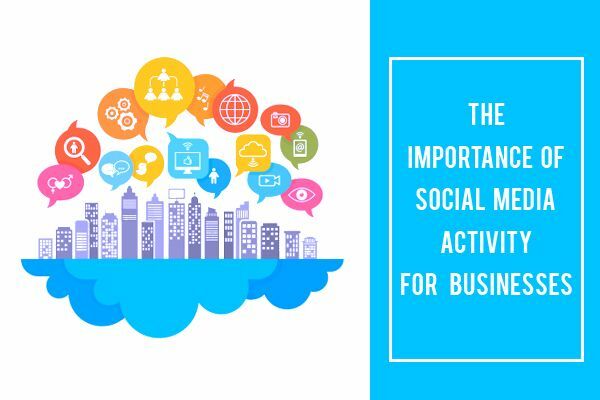 As a result, companies that realize the importance of social media are more likely to reap the rewards from their social media activity than those that don’t take an active approach to their online presence. Despite Google’s confirmation, by Matt Cutts, that social signals don’t affect search rankings, marketers shouldn’t be quick to discount the validity of social media. Even though social signals don’t affect search rankings, there are other benefits to social media activity. Kissmetrics recounts Brian Honigman’s statement that “links to your content on Facebook, Twitter, LinkedIn, Google+, YouTube and other social networks help the search engines understand what websites are credible”. Their article also reminds us that social media profiles do rank in search engines. When searching for a brand, you’ll often see the company’s social media profiles in results pages along with their website, which is why it’s important to stay active online. Keep in mind that just because Google doesn’t account for social signals, doesn’t mean that others don’t. Raventools points out that “Bing’s Webmaster Guidelines state that social media does contribute to ranking in search engines through influence, and that being influential in social leads to a higher organic search ranking over time”. So, while social signals don’t count towards Google, it does make a difference on Bing. One of the most common goals amongst businesses is building brand awareness. Social media can definitely help in achieving this goal! As mentioned earlier, social media helps businesses build two-way relationships with customers. It allows for better, more accessible communication between businesses and their audience. In their article, Inc also recounts eMarketer’s research which found that 33% of consumers said that they’ve discovered new brands, products, and services via social networks. The opportunity to reach a wider audience (or be found by them), only further drives the importance of social media activity. Another big benefit of social media activity is that it helps bring traffic to your website. Regular updates to your social media profiles that share links to high-quality content can encourage followers to click through to your blog or website. To add to this, according to Hubspot, “80% of marketers indicated that their social media efforts increased traffic”; with increased traffic, there are more opportunities for conversions. While social networks act as great platforms for promotion, don’t forget that one of the best practices for social media is to provide value. It’s a common mistake to see businesses being overly promotional on such platforms. So, always ensure your content helps to educate or provide a solution to your audience! Keep reading to see other social media mistakes you should avoid. Quick tip: Facebook allows you to create a call-to-action button on your Facebook business page, which you can use to direct potential customers into clicking through to your website. If you’re wondering about other best practices for social media, grab some tips from our article “Event Planning and Social Media: 4 online best practices of successful event planners”. As an event entertainment company that stresses the importance of social media, here’s our final takeaway: remember, it’s much more damaging to have inactive social media accounts, than not having them at all. So, don’t ignore the impact of consistent social media activity!